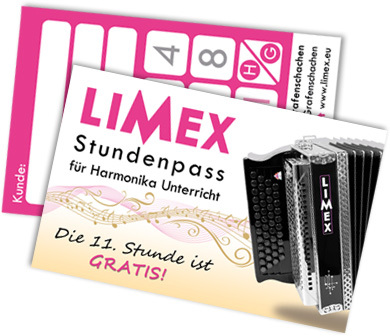 Limex offers you a different kind of Harmonica lessons. As we are a technological oriented company we combine traditionall and modern techniques to offer you the best learning experience. We are using traditionell Styrian (your instrument) and/or a electronic harmonica. your play becomes more exact, your Rhythmic becomes better, more fun, because you can hear more accompanying instruments, specifically designed programming of the electornic harmonica which promotes your training motivation, every age is welcome for learning. For optimal learning, we only offer individual lessons. This makes it possible for us to adapt the exercises to your needs. You can learn to play with notes, markings, or visually (just by simply showing) - as you wish. No matter if you are studying the Styrian harmonica as a hobby or even like to became world best, we have the perfect environment for you: You will be taught by real harmonica professionals - Manuel Šavron and Loui Herinx. Everyone knows: Music makes you happy and at the same time promotes your mental performance! Would you like to learn the Styrian harmonica but don’t like to buy an instrument yet? Then a rental harmoica is the perfect choice for an inexpensive and risk-free entry. * Please ask for terms and conditions, prices and availability at the customer center.